my life decisions which are always made by others. Oh my destiny, give me the answer, what am I for in this universe? 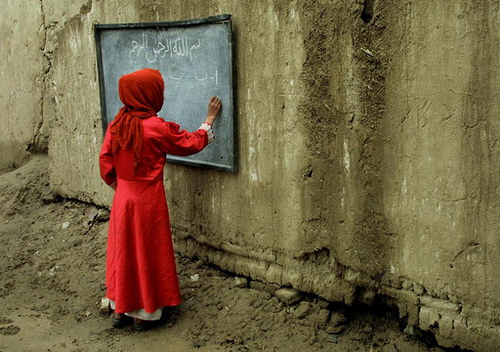 What does it mean to be an Afghan woman? So that I can write, that is all I am asking for! they can’t see that hidden pen with their blind eyes, no matter how strong their vision. people can read my poems on the reddish stream made by my blood. then the hidden pen will be remembered forever! Las decisiones sobre mi vida, tomadas siempre por otros. Oh destino, dame la respuesta, ¿para qué estoy en este universo? ¿Qué significa ser una mujer afgana? Para que pueda escribir, eso es todo lo que pido. Ceguera, da igual lo fuerte que sea su visión. La gente pueda leer mis poemas en el rojizo reguero de mi sangre. Entonces, la pluma secreta será recordada para siempre. Wow! “Read my poems on the reddish stream made by my blood.” The power of this image will stay in my blood. This is such strong work! It is a fire that cannot be put out. Very powerful Emaan, good for you! The words you pen weave a very fine tapestry of how “the reddish stream made by” your “blood” will create a knowing far slower than the gun, but far more powerful than hatred. Red words of deep intuition. Knowledge more ancient than “their blind eyes” or “their vision”. Thankyou. Your words went straight to my heart. Keep that hidden pen moving! Keep writing from the heart… You are doing such important work! Thank you for sharing your words with us across the world. This is great stuff! Keep up the good work Emaan!! Keep writing…find and take up that hidden pen. No man can stop your mind from thinking. No man can stop the hidden pen from writing down your beautiful thoughts! No matter how difficult (and I am sure it is so very, very, very hard) keep using your hidden pen. You are hope for the world…hope for a better tomorrow. You give me so much hope. You share so much beauty. I promise to continue to write as well because we all have dreams to share with others through our writing. Your words are so poignant and perfectly chosen. This poem brings tears to my eyes and inspires me for the strength that runs through it. You are a brave woman with a powerful point of view. Never let that be silenced and know that your pen is not so hidden after all. Others across the world are reading your words and sending as much hope as we can muster. Dear Emaan — The AWWP director Richelle McClain gave me the enormous honor of reading your poem at a conference of writers here in the U.S. – the Association of Writers and Writing Programs conference. The audience gasped aloud at your line about Ghazi stadium, and also murmured and nodded at the line about chalkboards and whiteboards. I will give you a million hidden pens until your voice is heard. It will lead to a day for young girls to be seen as equals and humans. You day will come and there will be no need for your hidden pens. Thank you so much for sharing you work. Do not let anyone else define who you are. Your work is very encouraging. Keep writing! !